Once upon a time, there was a director named Steven, a prince in the Kingdom of Hollywood. Steven was very talented and successful, so the king allowed him to make whatever movies he wanted, no matter how much time or treasure they took. Steven thought it would be funny to make a film about a Japanese submarine threatening Los Angeles shortly after the attack on Pearl Harbor. The king thought this was a great idea and opened his vaults and instructed his courtiers to do whatever Steven wanted. And so Steven gathered hundreds of his friends to make a comedy called The Night the Japs Attacked. It was scripted by Robert Zemeckis and Bob Gale, film school novices, who said their only writing experience had been spray-painting ethnic slurs on buildings. Steven hired William A. Fraker as director of photography, instead of his most excellent friend Vilmos Zsigmond. Alas, Steven neglected to tell squire Fraker they weren’t shooting for television. Steven once again hired bard John Williams, who wrote very loud music that would eventually be enjoyed by thousands of Bostonians every Fourth of July. Artisan Michael Kahn returned, a very good thing, because he was already used to editing hundreds of thousands of feet of Steven’s shoots and reshoots. Steven hired jester John Belushi and gave him much gold, which was immediately used to purchase many drugs. Steven directed crotch jokes and poop jokes and innuendos about lascivious maidens. Steven bought fancy new cameras and built miniature cities and flew tiny planes through them. He made a tank drive through a paint factory and built a house to push over a cliff. He rolled a Ferris wheel off a pier and called it very good, although the wheel’s lights stayed on the whole time. He directed more lascivious maiden jokes. Steven’s friend Stanley Kubrick thought it would make an excellent drama. A great darkness fell upon the kingdom. The king did not execute the prince, although film critics made convincing arguments. Years passed. An expanded version of Steven’s 1941 was shown on television and was embraced by the people. Zemeckis and Gale said it was because their crotch jokes and poop jokes and innuendos about lascivious maidens needed more backstory to be appreciated, although princes Abrahams, Zucker and Zucker disproved that theory with their short and cheap and very funny Airplane! (1980). More likely, it was because the people were able to turn down the volume on their TV sets. Once upon a time, there was a young critic who idolized King Steven. Late one night, he watched 1941 and fell asleep. He tried again the next night, armed with coffee and chocolate chip cookies. He was successful, although there was much weeping and gnashing of teeth. Years passed. The young critic became middle aged and started a blog, as young critics often do. 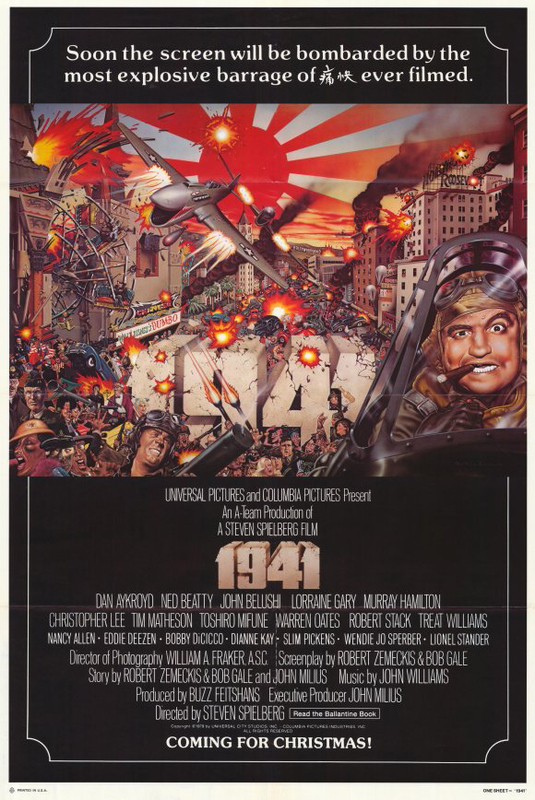 Early one evening, armed with triple IPA, he once again watched 1941. His jaw dropped at the awful Jaws joke in the beginning, featuring the same actress and the same composer. He was pleased to recognize many old friends, and he marveled at the miniature effects, as well as the ridiculous waste of money and talent. He chuckled once. Although he stayed awake, he checked his phone often. About halfway through the movie, the swing dance sequence started. He remembered seeing it when he was young, but now he marveled at the choreography and the sharp editing. He did some research and found out Chuck Jones had consulted on this part. When the movie was over, he went back and watched the dance scene again. And it was very good.